2013 Kia Sorento review | What Car? The Kia Sorento has always been a bit of a bargain and this new model continues to offer great value for money. 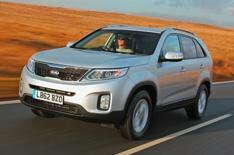 Granted, prices have risen by approximately 1500 compared with the outgoing model, but when you consider how many full-blown, seven-seat 4x4s can be had for less than 27k, it's clear the Sorento offers a massive amount of motoring for the money. It might not look that different from the car it replaces, but that same-again styling hides some pretty major changes. The biggest modification is a new lightweight chassis, which has helped the Sorento shed more than 100kg.?? The new car also has a modified bodyshell to help reduce noise and vibrations, while a more compact suspension arrangement helps boost interior space. What's the new Kia Sorento like to drive? The new Sorento shares most of its mechanicals with the Hyundai Santa Fe, including its 194bhp 2.2-litre diesel engine. That's a good thing, because the engine is strong and flexible, and, for the most part, very refined. Only when you push it close to the red line does any vibration find its way into the cabin.?? In an effort to improve ride comfort, Kia has decided to limit the Sorento's wheel size to a maximum of 18 inches, and first impressions suggest this is a wise decision. Our test car came on 17-inch alloys, and even then there's a degree of suspension patter at higher speeds on the motorway. However, the Sorento irons out low speed lumps and bumps effectively, and is far from uncomfortable. Travelling along on B-roads, the Sorento controls its mass pretty impressively, with very little pitching under braking and only a minimal amount of side-to-side body shimmying. It's just a shame the new electric steering feels so remote. There's a good deal of slack around the straight ahead and it takes a big armful of steering to get the nose of the car to turn in to corners. Kia says it has also upgraded the Sorento's brakes, but the pedal still feels decidedly wooden and needs a good stamp to bring the car to a halt. What's the new Kia Sorento like inside?.? The Sorento's dashboard is undoubtedly tough and durable, but it doesn't look anywhere near as modern the new Hyundai Santa Fe's, and the plastics aren't as soft or as classy, either.? The Sorento's seating layout is identical to the new Hyundai's, which means the middle row of seats can be slid forward to boost legroom for those in the third row.?? Access to the rear pair of seats isn't great, though, because you gain access only from the pavement side of the car, and the entrance itself is quite narrow. The rearmost seats fold down flat when you need a large extended load bay. There aren't many seven-seat SUVs to choose from at this price. Other than the Santa Fe, there's the rather dated Chevrolet Captiva and Volvo XC90, while the new Mitsubishi Outlander will be available from next spring. Faced with a choice between the Santa Fe and Sorento, you need to consider how important four-wheel-drive is; the Kia gets it as standard, whereas it costs an extra 1600 on the Hyundai. If you don't need four-wheel drive, we'd go for the Hyundai. It costs about the same and has a classier cabin and a smoother ride.